Surveyors are constantly exposed to traffic hazards, and without the right safety gear, surveying can be very dangerous. A typical worksite for a surveyor can involve vehicles traveling at a high rate of speed. To stay safe, it’s crucial to remain visible. Our Surveyors vest with orange lime stripes can increase visibility and work well for a variety of different jobs. 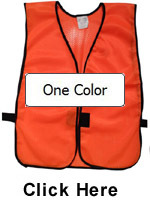 These vests are available in many different sizes and can be worn by workers in any occupation. We stock safety vests in lime and orange colors, and each version comes with the reflective stripes needed for maximum safety. Our vests are available with lime stripes, silver stripes or combinations. The surveyor vests are made of soft, lightweight material. They’re comfortable enough to wear for many hours at a time, so they’re especially useful for workers who frequently take on long shifts. Since they’re lightweight, you won’t feel like you’re lugging around a ton of extra weight. They feature a one-size-fits-most design, so they will fit most adults. These vests have a front zipper closure made of durable nylon The orange surveyor vests are made of 100 percent cotton and feature bright lime stripes. Come standard with two outside and two inside pockets. Click the button below to add the Cotton Orange Surveyors Vest with Lime Stripes to your wish list.